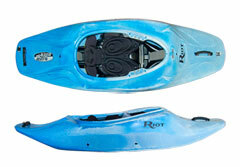 These freestyle kayaks are made for tricks and having fun on a river or particular feature. They are designed more for experienced paddlers who want to be able to do the latest tricks; be it in a hole, on a wave or on flat water. The Riot Astro is a freestyle playboat offering a crisp and dynamic feel for the paddler, allowing you to be creative and learn new tricks and flicks. The Wavesport Mobius is a fast, short and modern playboat with forgiving qualities that will give beginners the confidence to get into freestlye, whilst offering experienced paddlers enough performance for anything they want to do. The Wavesport Fuse a great little river running playboat that will help beginers develop and offer expreienced paddlers a really good all round kayak. We stock and supply playboats from the leading manufacturers. The models listed above are our most popular models, checkout our brand pages to find more freestyle kayaks available from Bournemouth Canoes.